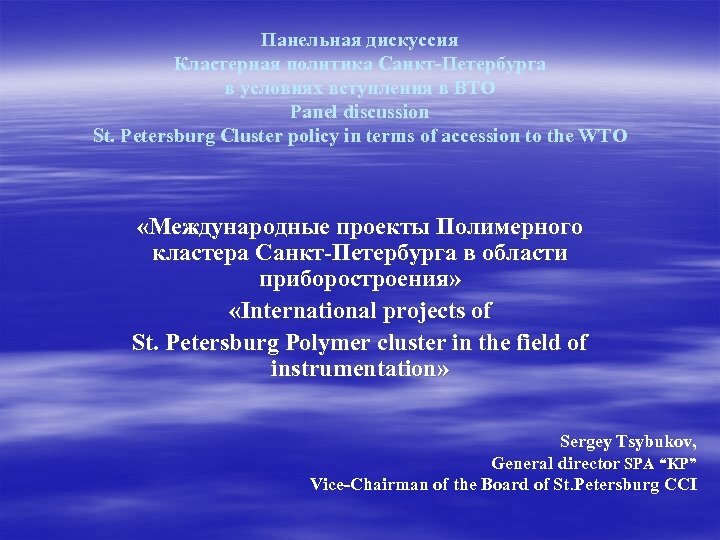 The Turku Process is a joint initiative of the City of Turku / Regional Council of Southwest Finland, the City of Saint Petersburg and the City of Hamburg, supported by the European Commission’s Directorate General for Regional Policy (DG REGIO). 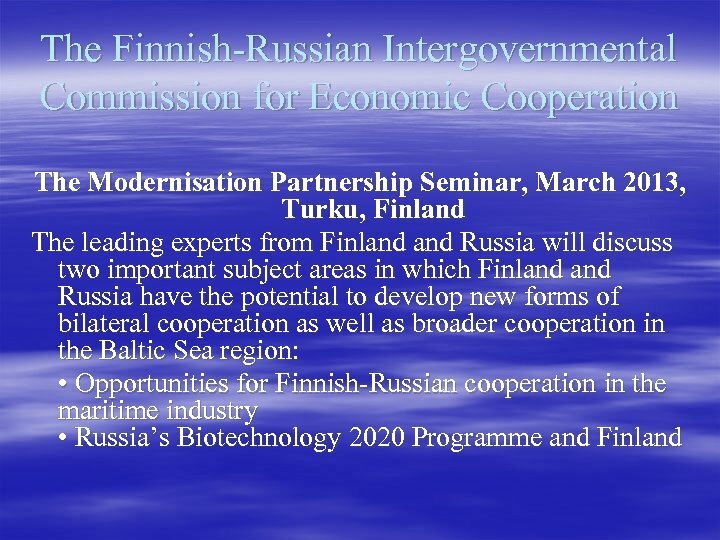 The Turku Process partners are currently preparing concrete projects in the fields of environment, innovative enterprise and the labour market. 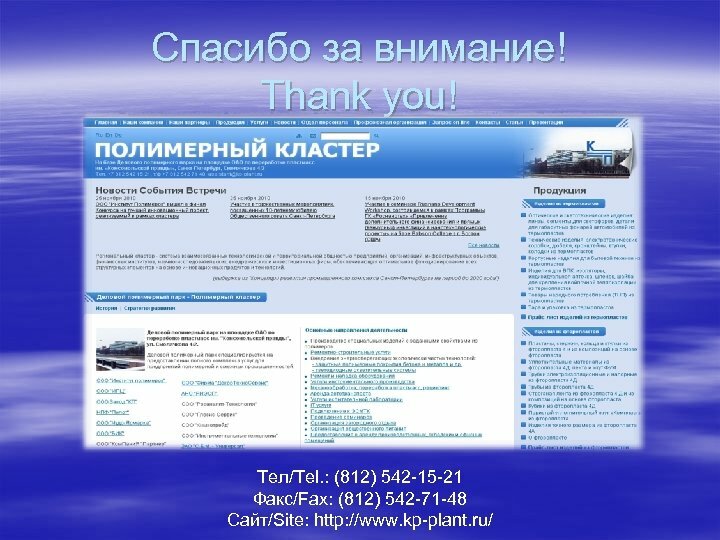 In the future, new fields of cooperation and partners can be included. 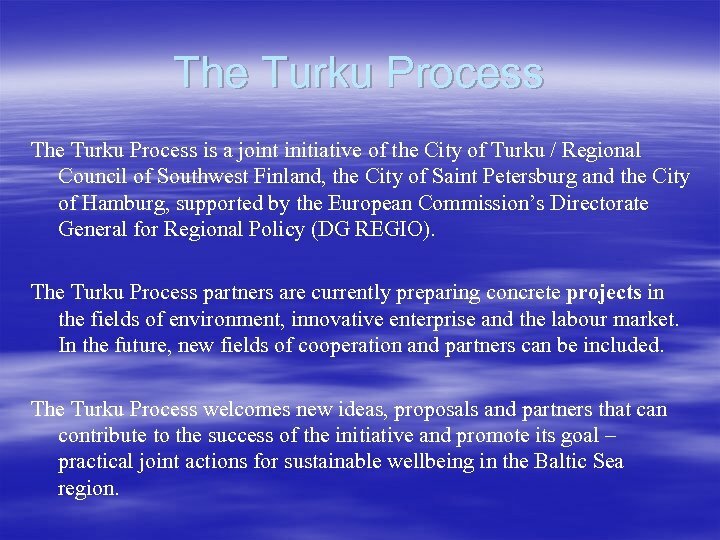 The Turku Process welcomes new ideas, proposals and partners that can contribute to the success of the initiative and promote its goal – practical joint actions for sustainable wellbeing in the Baltic Sea region. 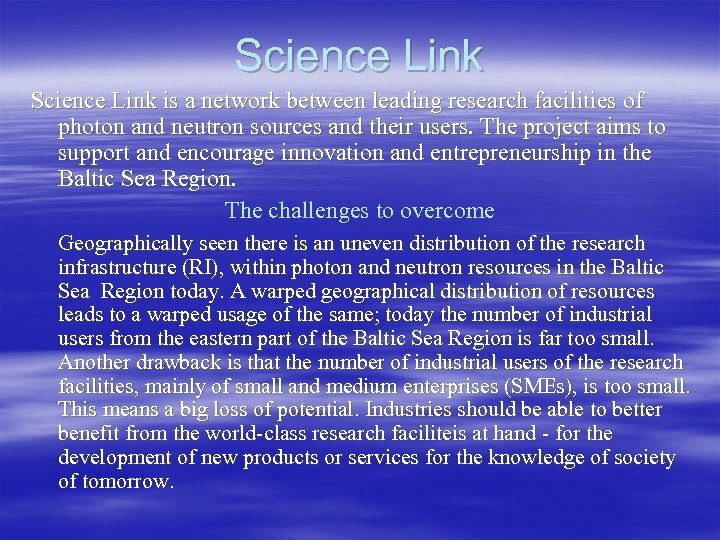 Science Link is a network between leading research facilities of photon and neutron sources and their users. 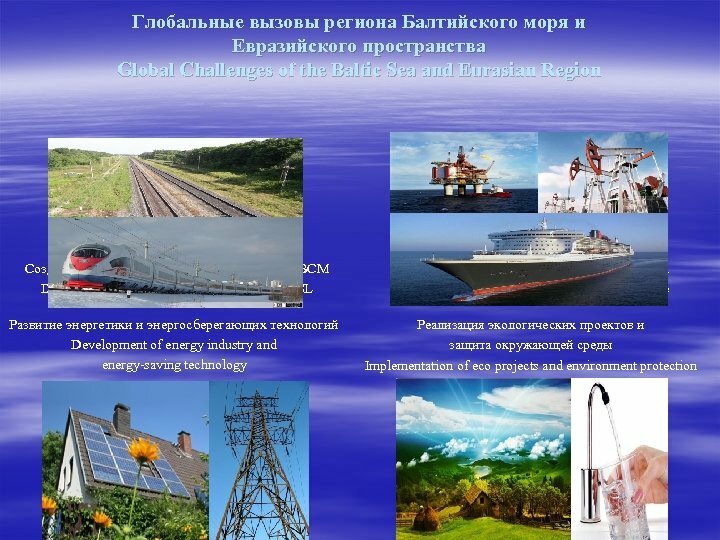 The project aims to support and encourage innovation and entrepreneurship in the Baltic Sea Region. 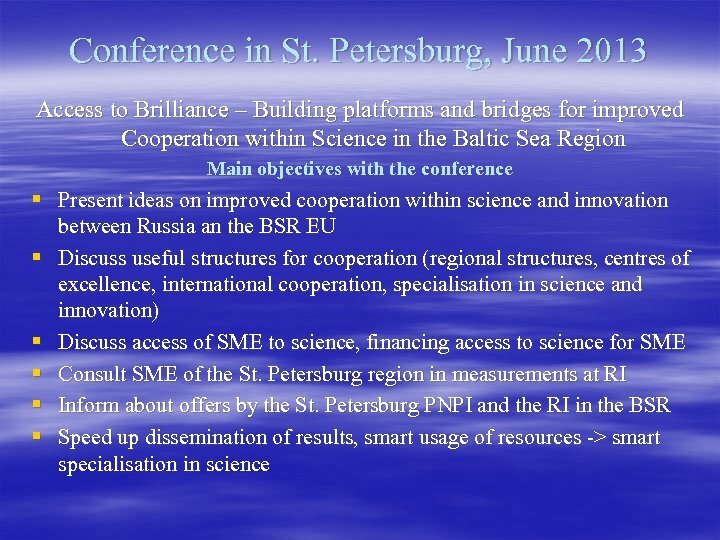 The challenges to overcome Geographically seen there is an uneven distribution of the research infrastructure (RI), within photon and neutron resources in the Baltic Sea Region today. A warped geographical distribution of resources leads to a warped usage of the same; today the number of industrial users from the eastern part of the Baltic Sea Region is far too small. Another drawback is that the number of industrial users of the research facilities, mainly of small and medium enterprises (SMEs), is too small. This means a big loss of potential. Industries should be able to better benefit from the world-class research faciliteis at hand - for the development of new products or services for the knowledge of society of tomorrow. 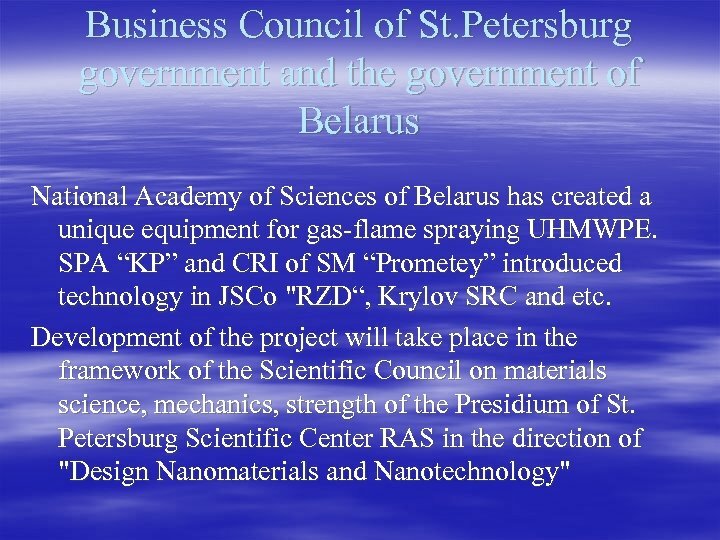 Business Council of St. Petersburg government and the government of Belarus National Academy of Sciences of Belarus has created a unique equipment for gas-flame spraying UHMWPE. 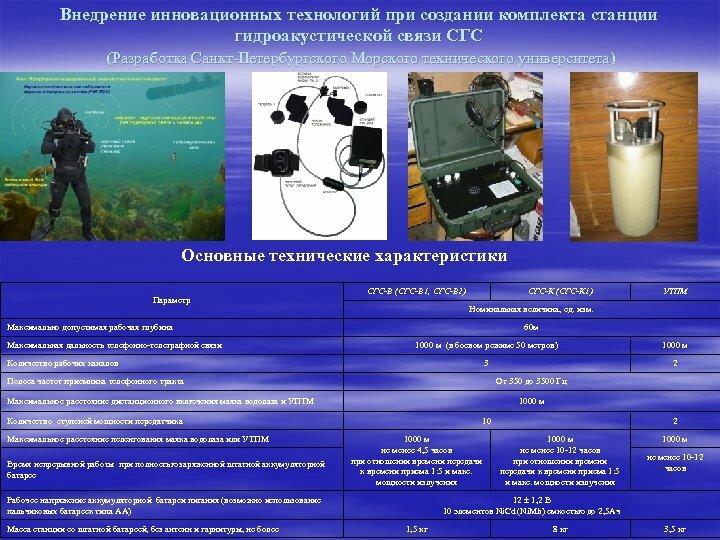 SPA “KP” and CRI of SM “Prometey” introduced technology in JSCo "RZD“, Krylov SRC and etc. 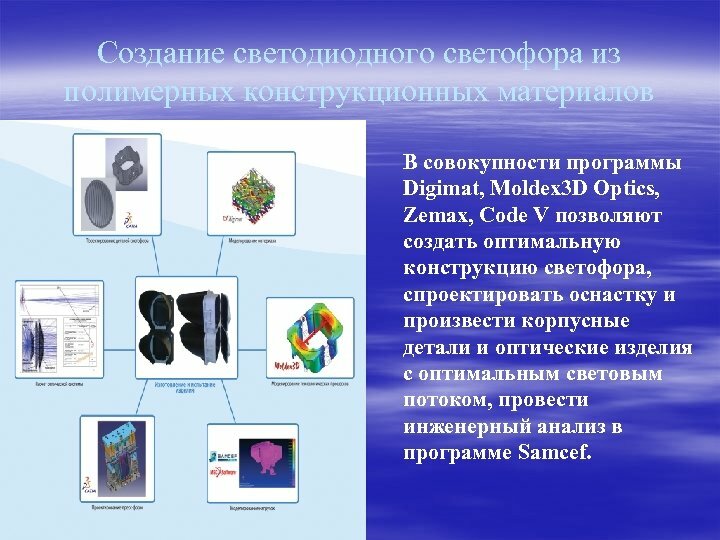 Development of the project will take place in the framework of the Scientific Council on materials science, mechanics, strength of the Presidium of St. Petersburg Scientific Center RAS in the direction of "Design Nanomaterials and Nanotechnology"
15 июня 2012 года в Санкт-Петербурге прошел второй бизнесфорум "Единое экономическое пространство: новые возможности промышленного развития" На форуме премьер-министры России – Д. А. Медведев, Казахстана – К. К. Касимов и Беларуси – М. В. Мясникович, обсудили перспективы создания специального фонда по развитию «прорывных» направлений: § создание конструкторских бюро с элементами IT- моделирования, которые позволят оперативно производить анализ и управление жизненным циклом инновационного продукта; § широкое использование конструкционных полимерных материалов; § роботизацию сложных технологических процессов. 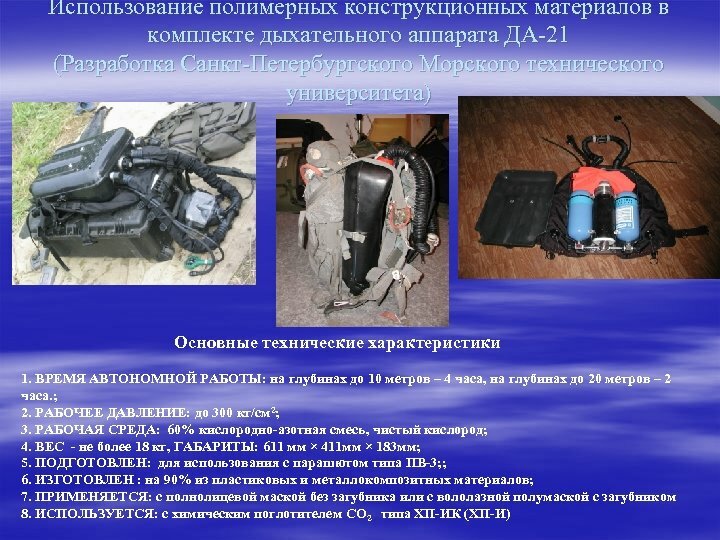 Создание светодиодного светофора из полимерных конструкционных материалов В совокупности программы Digimat, Moldex 3 D Optics, Zemax, Code V позволяют создать оптимальную конструкцию светофора, спроектировать оснастку и произвести корпусные детали и оптические изделия с оптимальным световым потоком, провести инженерный анализ в программе Samcef.